In electronics, a diode is a component that allows an electric current to flow in one direction but blocks it in the opposite direction. Thus, the diode can be thought of as an electronic version of a check valve. Circuits that require current flow in only one direction will typically include one or more diodes in the circuit design. Early diodes included "cat's whisker" crystals and vacuum tube devices (called "thermionic valves" in British English dialect). Today, the most common diodes are made from semiconductor materials such as silicon or germanium. Diodes are extremely useful devices for a variety of applications. For instance, they have been used for the demodulation of AM radio broadcasts; for rectifiers that convert alternating current into direct current; to conduct damaging high voltages away from sensitive electronic devices; to construct logic gates in electronic devices; for radiation and particle detectors; and for temperature-measuring devices. Thermionic and solid state diodes developed in parallel. The principle of operation of thermionic diodes was discovered by Frederick Guthrie in 1873. The principle of operation of crystal diodes was discovered in 1874, by the German scientist, Karl Ferdinand Braun. Thermionic diode principles were rediscovered by Thomas Edison on February 13, 1880, and he took out a patent in 1883 (U.S. Patent 307031 (PDF)), but developed the idea no further. Braun patented the crystal rectifier in 1899. The first radio receiver using a crystal diode was built around 1900, by Greenleaf Whittier Pickard. The first thermionic diode was patented in Britain by John Ambrose Fleming (scientific adviser to the Marconi Company and former Edison employee) on November 16, 1904 (U.S. Patent 803684 (PDF) in November 1905). Pickard received a patent for a silicon crystal detector on November 20, 1906 (U.S. Patent 836531 (PDF)). At the time of their invention, such devices were known as rectifiers. In 1919, William Henry Eccles coined the term diode from Greek roots; di means "two," and ode (from odos) means "path." The symbol for a vacuum tube diode. From top to bottom, the components are the anode, the cathode, and the heater. Thermionic diodes are thermionic valve devices (also known as vacuum tubes), which are arrangements of electrodes surrounded by a vacuum within a glass envelope, similar in appearance to incandescent light bulbs. In thermionic valve diodes, a current is passed through the heater filament. This indirectly heats the cathode, another filament treated with a mixture of barium and strontium oxides, which are oxides of alkaline earth metals; these substances are chosen because they have a small work function. (Some valves use direct heating, in which the heating current is passed through the cathode itself.) The heat causes thermionic emission of electrons into the vacuum envelope. In forward operation, a surrounding metal electrode, called the anode, is positively charged, so that it electrostatically attracts the emitted electrons. However, electrons are not easily released from the unheated anode surface when the voltage polarity is reversed and, hence, any reverse flow is a very tiny current. For much of the twentieth century thermionic valve diodes were used in analog signal applications, and as rectifiers in power supplies. Today, valve diodes are only used in niche applications, such as rectifiers in guitar and hi-fi valve amplifiers, and specialized high-voltage equipment. Diode schematic symbol. Conventional current can flow from the anode to the cathode, but not the other way around. Most modern diodes are based on semiconductor p-n junctions. In a p-n diode, conventional current flows from the p-type side (the anode) to the n-type side (the cathode), but not in the opposite direction. Another type of semiconductor diode, the Schottky diode, is formed from the contact between a metal and a semiconductor rather than by a p-n junction. A semiconductor diode's current-voltage, or I-V, characteristic curve is ascribed to the behavior of the so-called depletion layer or depletion zone which exists at the p-n junction between the differing semiconductors. When a p-n junction is first created, conduction band (mobile) electrons from the N-doped region diffuse into the P-doped region where there is a large population of holes (places for electrons in which no electron is present) with which the electrons "recombine." When a mobile electron recombines with a hole, the hole vanishes and the electron is no longer mobile. Thus, two charge carriers have vanished. The region around the p-n junction becomes depleted of charge carriers and, thus, behaves as an insulator. However, the depletion width cannot grow without limit. For each electron-hole pair that recombines, a positively-charged dopant ion is left behind in the N-doped region, and a negatively charged dopant ion is left behind in the P-doped region. As recombination proceeds and more ions are created, an increasing electric field develops through the depletion zone which acts to slow and then finally stop recombination. At this point, there is a "built-in" potential across the depletion zone. If an external voltage is placed across the diode with the same polarity as the built-in potential, the depletion zone continues to act as an insulator preventing a significant electric current. This is the reverse bias phenomenon. However, if the polarity of the external voltage opposes the built-in potential, recombination can once again proceed resulting in substantial electric current through the p-n junction. For silicon diodes, the built-in potential is approximately 0.6 volt (V). Thus, if an external current is passed through the diode, about 0.6 V will be developed across the diode such that the P-doped region is positive with respect to the N-doped region and the diode is said to be "turned on," as it has a forward bias. I-V characteristics of a P-N junction diode (not to scale). A diode's I-V characteristic can be approximated by two regions of operation. Below a certain difference in potential between the two leads, the depletion layer has significant width, and the diode can be thought of as an open (non-conductive) circuit. As the potential difference is increased, at some stage, the diode will become conductive and allow charges to flow, at which point it can be thought of as a connection with zero (or at least very low) resistance. More precisely, the transfer function is logarithmic, but so sharp that it looks like a corner on a zoomed-out graph. In a normal silicon diode at rated currents, the voltage drop across a conducting diode is approximately 0.6 to 0.7 volts. The value is different for other diode types—Schottky diodes can be as low as 0.2 V and light-emitting diodes (LEDs) can be 1.4 V or more (Blue LEDs can be up to 4.0 V). Referring to the I-V characteristics image, in the reverse bias region for a normal P-N rectifier diode, the current through the device is very low (in the µA range) for all reverse voltages up to a point called the peak-inverse-voltage (PIV). Beyond this point a process called reverse breakdown occurs, which causes the device to be damaged along with a large increase in current. For special purpose diodes like the avalanche or zener diodes, the concept of PIV is not applicable, since they have a deliberate breakdown beyond a known reverse current such that the reverse voltage is "clamped" to a known value (called the zener voltage or breakdown voltage). These devices, however, have a maximum limit to the current and power in the zener or avalanche region. The Shockley ideal diode equation or the diode law (named after transistor co-inventor William Bradford Shockley) is the I-V characteristic of an ideal diode in either forward or reverse bias (or no bias). It is derived with the assumption that the only processes giving rise to current in the diode are drift (due to electrical field), diffusion, and thermal recombination-generation. It also assumes that the recombination-generation (R-G) current in the depletion region is insignificant. This means that the Shockley equation doesn't account for the processes involved in reverse breakdown and photon-assisted R-G. Additionally, it doesn't describe the "leveling off" of the I-V curve at high forward bias due to internal resistance, nor does it explain the practical deviation from the ideal at very low forward bias due to R-G current in the depletion region. These diodes operate as described above. Usually made of doped silicon or, more rarely, germanium. Before the development of modern silicon power rectifier diodes, cuprous oxide and later selenium was used; its low efficiency gave it a much higher forward voltage drop (typically 1.4–1.7 V per "cell," with multiple cells stacked to increase the peak inverse voltage rating in high voltage rectifiers), and required a large heat sink (often an extension of the diode's metal substrate), much larger than a silicon diode of the same current ratings would require. Schottky diodes are constructed from a metal to semiconductor contact. They have a lower forward voltage drop than a standard PN junction diode. Their forward voltage drop at forward currents of about 1 mA is in the range 0.15 V to 0.45 V, which makes them useful in voltage clamping applications and prevention of transistor saturation. They can also be used as low loss rectifiers although their reverse leakage current is generally much higher than non Schottky rectifiers. Schottky diodes are majority carrier devices and so do not suffer from minority carrier storage problems that slow down most normal diodes. They also tend to have much lower junction capacitance than PN diodes and this contributes towards their high switching speed and their suitability in high speed circuits and RF devices such as mixers and detectors. As a dopant, gold (or platinum) acts as recombination centers, which help a fast recombination of minority carriers. This allows the diode to operate at signal frequencies, at the expense of a higher forward voltage drop. A typical example is the 1N914. The term "step recovery" relates to the form of the reverse recovery characteristic of these devices. After a forward current has been passing in an SRD and the current is interrupted or reversed, the reverse conduction will cease very abruptly (as in a step waveform). SRDs can therefore provide very fast voltage transitions by the very sudden disappearance of the charge carriers. These work the same as the junction semiconductor diodes described above, but its construction is simpler. A block of n-type semiconductor is built, and a conducting sharp-point contact made with some group-3 metal is placed in contact with the semiconductor. Some metal migrates into the semiconductor to make a small region of p-type semiconductor near the contact. 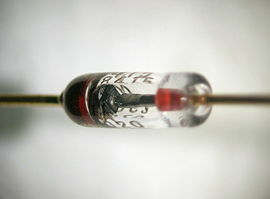 The long-popular 1N34 germanium version is still used in radio receivers as a detector and occasionally in specialized analog electronics. These are a type of point contact diode. The cat's whisker diode consists of a thin or sharpened metal wire pressed against a semiconducting crystal, typically galena or a lump of coal. The wire forms the anode and the crystal forms the cathode. Cat's whisker diodes were also called crystal diodes and found application in crystal radio receivers. Cat's whisker diodes are obsolete. A PIN diode has a central un-doped, or intrinsic, layer, forming a p-type / intrinsic / n-type structure.Width of the Intrinsic layer is greater than that of P and N. They are used as radio frequency switches, similar to varactor diodes but with a more sudden change in capacitance. They are also used as large volume ionizing radiation detectors and as photodetectors. PIN diodes are also used in power electronics, as their central layer can withstand high voltages. Furthermore, the PIN structure can be found in many power semiconductor devices, such as IGBTs, power MOSFETs, and thyristors. 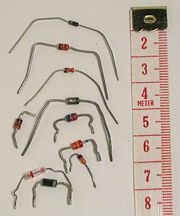 These are used as voltage-controlled capacitors. These are important in PLL (phase-locked loop) and FLL (frequency-locked loop) circuits, allowing tuning circuits, such as those in television receivers, to lock quickly, replacing older designs that took a long time to warm up and lock. A PLL is faster than a FLL, but prone to integer harmonic locking (if one attempts to lock to a broadband signal). They also enabled tunable oscillators in early discrete tuning of radios, where a cheap and stable, but fixed-frequency, crystal oscillator provided the reference frequency for a voltage-controlled oscillator. Diodes that can be made to conduct backwards. This effect, called Zener breakdown, occurs at a precisely defined voltage, allowing the diode to be used as a precision voltage reference. In practical voltage reference circuits Zener and switching diodes are connected in series and opposite directions to balance the temperature coefficient to near zero. Some devices labeled as high-voltage Zener diodes are actually avalanche diodes. Two (equivalent) Zeners in series and in reverse order, in the same package, constitute a transient absorber (or Transorb, a registered trademark). They are named for Dr. Clarence Melvin Zener of Southern Illinois University, inventor of the device. Diodes that conduct in the reverse direction when the reverse bias voltage exceeds the breakdown voltage. These are electrically very similar to Zener diodes, and are often mistakenly called Zener diodes, but break down by a different mechanism, the avalanche effect. This occurs when the reverse electric field across the p-n junction causes a wave of ionization, reminiscent of an avalanche, leading to a large current. Avalanche diodes are designed to break down at a well-defined reverse voltage without being destroyed. The difference between the avalanche diode (which has a reverse breakdown above about 6.2 V) and the Zener is that the channel length of the former exceeds the "mean free path" of the electrons, so there are collisions between them on the way out. The only practical difference is that the two types have temperature coefficients of opposite polarities. These are avalanche diodes designed specifically to protect other semiconductor devices from high-voltage transients. Their p-n junctions have a much larger cross-sectional area than those of a normal diode, allowing them to conduct large currents to ground without sustaining damage. Semiconductors are subject to optical charge carrier generation and therefore most are packaged in light blocking material. If they are packaged in materials that allow light to pass, their photosensitivity can be utilized. Photodiodes can be used as solar cells, and in photometry. In a diode formed from a direct band-gap semiconductor, such as gallium arsenide, carriers that cross the junction emit photons when they recombine with the majority carrier on the other side. Depending on the material, wavelengths (or colors) from the infrared to the near ultraviolet may be produced. The forward potential of these diodes depends on the wavelength of the emitted photons: 1.2 V corresponds to red, 2.4 to violet. The first LEDs were red and yellow, and higher-frequency diodes have been developed over time. All LEDs are monochromatic; "white" LEDs are actually combinations of three LEDs of a different color, or a blue LED with a yellow scintillator coating. LEDs can also be used as low-efficiency photodiodes in signal applications. An LED may be paired with a photodiode or phototransistor in the same package, to form an opto-isolator. When an LED-like structure is contained in a resonant cavity formed by polishing the parallel end faces, a laser can be formed. Laser diodes are commonly used in optical storage devices and for high speed optical communication. These have a region of operation showing negative resistance caused by quantum tunneling, thus allowing amplification of signals and very simple bistable circuits. These diodes are also the type most resistant to nuclear radiation. These are similar to tunnel diodes in that they are made of materials such as GaAs or InP that exhibit a region of negative differential resistance. With appropriate biasing, dipole domains form and travel across the diode, allowing high frequency microwave oscillators to be built. These are used as sensors, heat engines for thermoelectric cooling. Charge carriers absorb and emit their band gap energies as heat. These are actually a JFET with the gate shorted to the source, and function like a two-terminal current-limiting analog to the Zener diode; they allow a current through them to rise to a certain value, and then level off at a specific value. Also called CLDs, constant-current diodes, diode-connected transistors, or current-regulating diodes. Other uses for semiconductor diodes include sensing temperature, and computing analog logarithms (see Operational amplifier applications#Logarithmic). The first use for the diode was the demodulation of amplitude modulated (AM) radio broadcasts. In summary, an AM signal consists of alternating positive and negative peaks of voltage, whose amplitude or "envelope" is proportional to the original audio signal, but whose average value is zero. The diode (originally a crystal diode) rectifies the AM signal, leaving a signal whose average amplitude is the desired audio signal. The average value is extracted using a simple filter and fed into an audio transducer, which generates sound. Rectifiers are constructed from diodes, where they are used to convert alternating current (AC) electricity into direct current (DC). Similarly, diodes are also used in Cockcroft-Walton voltage multipliers to convert AC into very high DC voltages. Diodes are frequently used to conduct damaging high voltages away from sensitive electronic devices. They are usually reverse-biased (non-conducting) under normal circumstances, and become forward-biased (conducting) when the voltage rises above its normal value. For example, diodes are used in stepper motor and relay circuits to de-energize coils rapidly without the damaging voltage spikes that would otherwise occur. Many integrated circuits also incorporate diodes on the connection pins to prevent external voltages from damaging their sensitive transistors. Specialized diodes are used to protect from over-voltages at higher power. Diodes can be combined with other components to construct AND and OR logic gates. This is referred to as diode logic. In addition to light, mentioned above, semiconductor diodes are sensitive to more energetic radiation. In electronics, cosmic rays and other sources of ionizing radiation cause noise pulses and single and multiple bit errors. This effect is sometimes exploited by particle detectors to detect radiation. A single particle of radiation, with thousands or millions of electron volts of energy, generates many charge carrier pairs, as its energy is deposited in the semiconductor material. If the depletion layer is large enough to catch the whole shower or to stop a heavy particle, a fairly accurate measurement of the particle's energy can be made, simply by measuring the charge conducted and without the complexity of a magnetic spectrometer. These semiconductor radiation detectors need efficient and uniform charge collection and low leakage current. They are often cooled by liquid nitrogen. For longer range (about a centimeter) particles they need a very large depletion depth and large area. For short range particles, they need any contact or un-depleted semiconductor on at least one surface to be very thin. The back-bias voltages are near breakdown (around a thousand volts per centimeter). Germanium and silicon are common materials. Some of these detectors sense position as well as energy. They have a finite life, especially when detecting heavy particles, because of radiation damage. Silicon and germanium are quite different in their ability to convert gamma rays to electron showers. Semiconductor detectors for high energy particles are used in large numbers. Because of energy loss fluctuations, accurate measurement of the energy deposited is of less use. A diode can be used as a temperature measuring device, since the forward voltage drop across the diode depends on temperature. This temperature dependence follows from the Shockley ideal diode equation given above and is typically around -2.2 mV per degree Celsius. Digital cameras and similar units use arrays of photo diodes, integrated with readout circuitry. Diodes may also be referred to as controlled rectifiers, abbreviated CR on printed wiring boards. ↑ Nobel Prize, The diode. Retrieved June 11, 2008. ↑ S. M. Sze, Modern Semiconductor Device Physics (Wiley Interscience, ISBN 0-471-15237-4). Neudeck, George W. 1988. The PN Junction Diode. Upper Saddle River, NJ: Prentice Hall. ISBN 0201122960. Pierret, Robert F. 1988. Semiconductor Fundamentals. Upper Saddle River, NJ: Prentice Hall. ISBN 0201122952. Sze, S.M. 1997. Modern Semiconductor Device Physics. Hoboken, NJ: Wiley Interscience, ISBN 0471152374. This page was last modified on 19 August 2013, at 14:16.